Whether it’s bubble baths or before bedtime snuggles, create lasting memories for a healthy baby development with our extensive range of baby lotion products. If you are looking for a moisturizing lotion suitable for your little one’s skin and your whole family, then JOHNSON’S baby lotion is your perfect choice. Paediatrician-tested and perfectly pH-balanced, Johnson’s range of baby lotions will nourish your baby’s delicate skin and protect it from dryness. Have you noticed that your newborn’s skin is irritated? Trust JOHNSON’S® Baby Lotion as the best-suited lotion for baby eczema. 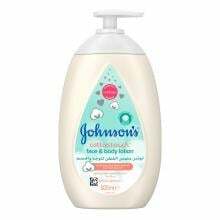 Shop online for JOHNSON’S baby lotion range that includes JOHNSON’S® Baby Bedtime Lotion, JOHNSON’S® Baby Lotion and JOHNSON’S® cottontouch™ Face & Body Lotion from SOUQ.COM in the middle east, to ensure your newborn’s skin is feeling incredibly smooth for 24 hours. Take extra care of your baby’s skin and use JOHNSON’S® Baby Lotion after shower in your massage routine and you will notice the difference in your newborn’s skin. Free of harsh fragrances, your baby JOHNSON’S® Baby Bedtime lotion clinically shown to last all night long.